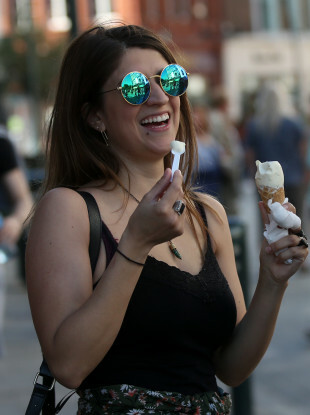 Priscilla Ribeiro from Brazil enjoying ice cream in Dublin city last month. MANY PLACES ARE set to experience sunny weather this weekend, with temperatures due to hit the high 20s next week. It’s expected to reach 28 or 29 degrees Celsius is some areas in the coming days. Today will be dry and mostly sunny with light variable breezes, Met Éireann has said. However, there’ll be a bit more cloud at times in northern parts of Ulster and Connacht. Highest temperatures will range from 17 to 23 degrees. It will be coldest on Connacht and Ulster coasts, and warmest in inland parts of Leinster and Munster. Tonight is expected to be dry and mostly clear, with lowest temperatures of six to nine degrees. The good weather will continue tomorrow and highest temperatures will range from 20 to 25 degrees. A large area of high pressure will remain close to Ireland throughout next week, meaning the weather will be warm, dry and mostly sunny. Tomorrow night will be another fairly cool night, with lowest temperatures of seven to 10 degrees. However, for the rest of next week, the nights will be milder with temperatures falling no lower than 13 or 14 degrees. From Monday until next Saturday, the weather is expected to be dry and mostly sunny. There’ll be a chance of a little sea fog at times and there may be a bit more cloud in the west towards the end of the week. “It will be very warm or hot with temperatures mostly in the low to mid 20s on Monday and Tuesday and reaching the mid to high 20s in many areas for the rest of the week,” Met Éireann said. Here are some tips on keeping yourself and your pets safe during the warm weather. Email “'It will be very hot': Temperatures set to hit high 20s next week”. Feedback on “'It will be very hot': Temperatures set to hit high 20s next week”.